This artist's illustration shows the atmosphere of a brown dwarf called 2MASSJ22282889-431026, which was observed simultaneously by NASA's Spitzer and Hubble space telescopes. 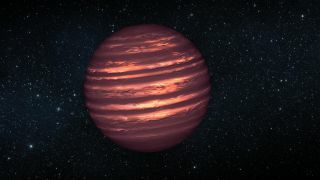 The telescopes' observations indicate this brown dwarf is marked by wind-driven, planet-size clouds. LONG BEACH, Calif. — Astronomers have mapped out the weird and wild weather of a so-called "failed star" in unprecedented detail. Using NASA’s Spitzer and Hubble space telescopes, researchers documented the windy, cloud-covered weather of a brown dwarf — a strange celestial object too big to be a planet but not massive enough to undergo fusion reactions like a star. The new results were presented at the American Astronomical Society meeting here Tuesday (Jan. 8). Like the objects themselves, brown dwarf weather is odd and intriguing, researchers said. "Unlike the water clouds of Earth or the ammonia clouds of Jupiter, clouds on brown dwarfs are composed of hot grains of sand, liquid drops of iron and other exotic compounds," study co-author Mark Marley, of NASA’s Ames Research Center in Moffett Field, Calif., said in a statement. "So this large atmospheric disturbance found by Spitzer and Hubble gives a new meaning to the concept of extreme weather." This artist's concept shows the brown dwarf 2MASSJ22282889-431026, which has a turbulent atmosphere somewhat similar to the giant planet Jupiter's. The two spacecraft monitored a brown dwarf with the clunky name of 2MASS J22282889-431026. Spitzer and Hubble used different wavelengths of light to monitor the ways its clouds moved at any given time, spotting storms the size of Earth swirling through the brown dwarf's atmosphere. Although such observations are new for odd objects such as brown dwarfs, weather patterns like this have been observed elsewhere in the universe. "What we see here is evidence for massive, organized cloud systems, perhaps akin to giant versions of the Great Red Spot on Jupiter," co-author Adam Showman of the University of Arizona said in a statement. "These out-of-sync light variations provide a fingerprint of how the brown dwarf’s weather systems stack up vertically," Showman added. "The data suggest regions on the brown dwarf where the weather is cloudy and rich in silicate vapor deep in the atmosphere coincide with balmier, drier conditions at higher altitudes — and vice versa." While they're cooler than bona fide stars, brown dwarfs are still extremely hot. The brown dwarf the team studied has an estimated temperature between 1,100 and 1,300 degrees Fahrenheit (600 to 700 degrees Celsius). Researchers plan to use Spitzer and Hubble to monitor the weather of more brown dwarfs in the future to see how this one stacks up by comparison. The techniques employed in the study should also come in handy to help characterize alien planets with future instruments, scientists said.